According to statistics from the City of Omaha, over 67,000 cars pass through the intersection of Maple and 83th Streets every day. If you happen to be one of the motorists who travels this route, be certain to pay special attention to the billboard overlooking this junction. New York-based artist Mathieu Borysevicz uses the billboard positioned at this crossroads to explore how large-scale advertising images affect our personal space and visual perceptions. His project Untitled (Omaha, Nebraska) is in collaboration with the Bemis Center for Contemporary Arts and is made possible by funding from the Peter Kiewit Foundation, the Nebraska Arts Council and LAMAR Advertising and a generous grant from the Nimoy Foundation. Borysevicz’s billboard is up and “live” beginning this Friday, April 29th, and the project will run for four weeks through the end of May. This project is capturing media attention in print and radio, so make sure to pay special attention to the following this Friday: flip to the Living section of the Omaha World Herald as arts writer Ashley Hassebroek profiles the Billboard Project; tune that radio dial to KVNO 90.7 FM at 8:30 a.m. and again at 5:00 p.m. as News & Public Affairs Coordinator Cheril Lee talks with Borysevicz about the inspiration behind the installation. But don’t just keep up with the news about Borysevicz’s Billboard – take a drive to Maple & 83rd Streets on the north side of the street facing west (It’s best to come east from 90th). 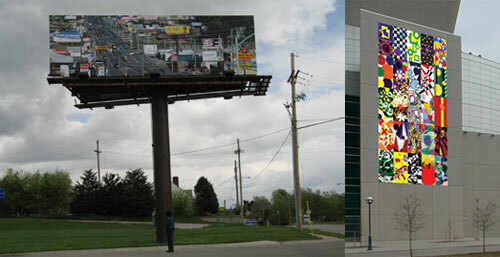 Whether by foot or car, bus or bike make Untitled (Omaha, Nebraska) at Maple and 83rd. Streets your next destination and consider how ordinary intersections intersect with our everyday lives. But that’s not the only media attention the Bemis Center is getting this spring! Tune in to Nebraska Public Television (NETV)’s award-winning Statewide programin June for a behind-the scenes look at the Bemis Center’s Art for Omaha Project 2 Cultural Quilt. These segments feature interviews with Project 2 community group participants Girls Inc. and Central High School as they provide insights into their creative processes. Coverage of the Opening Reception for the Cultural Quilt participants that took place at the Bemis Center on Saturday April 23rd is also included. We'll keep you posted on the air date, so you can make sure to tune in to NETV!